Mumbai: The current slowdown in the auto industry was “so sudden that it took everyone by surprise", Ravi Kant, managing director of Tata Motors Ltd, said. As India’s largest automobile maker, the company has been hit hard both by the global financial slowdown and the burden of its $2.3 billion (Rs1.03 trillion) acquisition of the iconic Jaguar Land Rover (JLR) brands from Ford Motor Co. earlier this year. “It (the auto sector) is a cyclical industry and downturns are normal here," Kant said in an interview. “But everything that happened (this time) was outside the control of the industry" and the current slump is an “abnormal business cycle". In the six months to 30 September, Tata Motors reported revenues of Rs13,916.35 crore, a 10.29% increase over Rs12,617.13 crore in the corresponding period last year. But investors are not convinced, expecting the third quarter to be a washout. Tata Motor’s market capitalization has fallen to Rs7,865.09 crore from Rs29,419.39 crore at the beginning of this year. In the same period, the Bombay Stock Exchange (BSE) benchmark index, the Sensex, in which Tata Motors has a 0.74% weightage, declined 75.67%. The BSE auto index has fallen 56.52% this year. “Tata Motors is caught in a downturn in its core automobile business. Volumes have taken a severe beating across segments," Ramnath S. and Aniket Mhatre, analysts at brokerage IDFC-SSKI Securities Ltd, wrote in a recent report. “The situation is grave as indicated by the recent plant shut-downs announced by the company (six days at Lucknow and Pune plants, and three days at Jamshedpur in November) to realign production." The JLR buyout has proved a burden. Tata Motors had turned to the UK government for a bailout as it struggled to source funding to repay debt and fund any deficit for JLR’s pension plan, but was refused. On Monday, the Financial Times newspaper reported that Tata Motors had agreed to inject “tens of millions" of pounds into the subsidiary. Kant refused to talk on JLR. Globally, the auto industry is fighting the downturn with its back against the wall as demand has fallen precipitously in the past few months. “Passenger vehicle segment registered 8.1% year-on-year (y-o-y) decline; domestic volumes were down 23.6% y-o-y," analysts Shilpa Gupta and Hemant Joshi of ICICI Securities Ltd wrote in a 16 December report titled “Caught in Crossfire". “The truck segment was the worst performer, contracting a substantial 48% y-o-y as medium and heavy commercial vehicles were down 60.6% y-o-y. Light commercial vehicles were down 33.8%," the report said. Tata Motors, a major player in all three segments, is caught in the crossfire. In early December, the government announced a $4 billion fiscal stimulus package including a 4% cut in central value-added tax. But auto makers are not convinced. “If they want to spread it (sops) and make it thin, it won’t work. The government has to prioritize and re-crank the industry," said Kant. “I am talking about incentives...the auto industry is not looking for crutches where the aid will be written off," he says. “The government should be pragmatic and seized of the situation. They should prioritize and direct banks to provide vehicle-financing, working capital for auto makers, (and) some kind of a holiday for the huge investments made with good intention by the industry." Kant is looking to a “big-bang" government package that will bring customers and lenders back to the auto industry, as the company prepares to launch a slew of new trucks, buses and cars in 2009, including the small car Nano. Like other auto companies, Tata Motors is rationalizing production at plants in Jamshedpur, Pune and Lucknow, but is also expanding. “In the first half of next year, we will introduce a family of world trucks in South Korea and India simultaneously. Also lined up are a whole family of small trucks and...a family of buses. We have set up a plant in Uttarakhand to manufacture a family of small Ace trucks with a capacity of 2.5 lakh numbers. In Gujarat, (we are setting up) a new plant to make Nano cars having a capacity of 2.5 lakh vehicles, and a joint venture with Fiat of Italy to make 100,000 cars." The company is also setting up a bus factory that it expects to become the largest in the world. “I’ve got the (production) capacity and I have got the products. All I need are customers." “When the economic growth really began to totter, even if some customers were willing to spend on interest rates, they suddenly found that loads were not available for truckers to make business commercially feasible. The capacity utilization for goods trucks was not optimal like before and loads began to shrink. The complete chain, of parts suppliers, manufacturers and dealers are finding it difficult to run business, like in the past," said Kant. He is not far from the truth. Abhijeet Naik and Alok Rawat, analysts with CLSA Asia-Pacific Markets, wrote in a recent report titled “CVs–1998 Once More" on how times have changed for the worse for the auto industry. CV is short for commercial vehicles. “Demand for trucks has collapsed in India. Our channel checks with dealers and financiers suggests that the October weakness has worsened in November. Defaults have risen sharply in October and truck operators have now started surrendering trucks to banks," they wrote. In 2006, the government and the auto industry made a plan called the Automotive Mission Plan 2006-2016 for development of the local industry. The plan envisaged India emerging as the world’s seventh largest car producer from 11th currently, and retaining the fourth position in world truck manufacturing. Also, Kant said, the auto sector would by 2016 double its contribution to the country’s GDP from the current levels of 5-10%. Its contribution to manufacturing would rise to 35% from 17%. But the current crisis could have given a quiet burial to this plan. Industry data for November said sales dropped by 60% for heavy and medium commercial vehicles, 20-25% for light and commercial vehicles and 30-35% for passenger cars. A back-of-the-envelope calculation shows that if sales drop by 50%, production would be cut by 70% for three-four months. So the next three-four months will be painful and tough because market equilibrium has been distorted, Kant said. “You will continue to hear that this or that plant is getting closed. It so happens that Tata Motors is first to react to this and closed production. Now you see everybody doing what we did," Kant said. Maruti Suzuki India Ltd, Toyota Kirloskar Motor Pvt. Ltd and Bajaj Auto Ltd have announced production cuts of 20-30%. 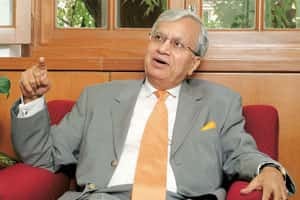 “Every player has sincerely created capacity in the commercial vehicles and passenger car segment," said Kant, who is also president of industry body Society of Indian Automobile Manufacturers. “We are cutting costs wherever possible. Whether it is a fixed cost or variable cost, there is limitation because 70% of the costs are incurred on steel products such as forgings, castings, etc.," Kant said. “So, if steel prices went up 40% and interest rates also rose, your manoeuvreability is limited. Our margin on a vehicle is about 6-7%, so you can imagine how it affected us when commodities such as steel soared," he said.